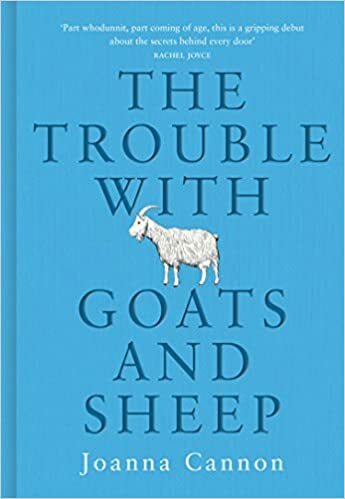 Part coming-of-age novel, part mystery, The Trouble with Goats and Sheep is a quirky and utterly charming debut about a community in need of absolution and two girls learning what it means to belong. Spunky, spirited Grace and frail, nervous Tilly go door to door in search of clues. As the cul-de-sac starts giving up its secrets, the amateur detectives uncover much more than they could have imagined. Instead of finding their missing neighbor, they must try to make sense of what they’ve seen and heard, and a complicated history of deception begins to emerge. Everyone on the Avenue has something to hide, a reason for not fitting in. It’s only in the suffocating heat of the summer, that the ability to guard these differences becomes impossible. Along with the parched lawns and the melting pavement, the lives of all the neighbors begin to deconstruct. What the girls don’t realize is that the lies told to conceal what happened one fateful day about a decade ago are the same ones Mrs. Creasy was beginning to peel back just before she disappeared. Now and again I fancy something a bit different from the Crime genre that I normally throw myself into and when I read the description of The Trouble With Goats and Sheep I really had to give it a go. The story is largely told through the eyes of ten year old Gracie, who along with her friend Tilly, are determined to find their missing neighbour Mrs Creasy. I was completely immersed in the story and truly felt part of “The Avenue”. Set in the long hot summer of 1976 it’s a great nostalgic trip for anyone who was brought up in the 70s and although I was only 4 at that time, it really threw me back to the time with thoughts of Butterscotch Angel Delight and sitting in my granddads chair looking at the toys in the Kays catalogue. It’s a Happy/Sad story that uses flashbacks from residents of The Avenue with the story unfolding beautifully and the truth about Mrs Creasy is revealed. The Trouble With Goats and Sheep is funny and heart breaking. A great debut novel from Joanna Cannon. and a book I highly recommend.